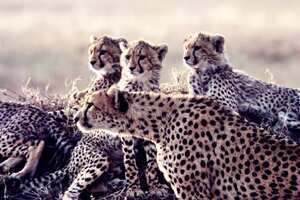 ‘Cheetahs Against All Odds’, one of the films being screened. The fifth edition of Vatavaran, the Centre for Media Studies (CMS) Environment and Wildlife Film Festival, begins today. Based on the theme of climate change and sustainable technologies, the festival will have an array of film screenings, workshops and seminars. Aimed at sensitizing people to the rich environmental heritage and the need for conservation, CMS Vatavaran will also hold a workshop for the media on Delhi’s Bus Rapid Transit System. Ecotourism, natural heritage conservation and media for conservation will be some topics for debate. Amongst Tigers and Elephants, a TV series directed by Naresh Bedi shot in the Corbett National Park, is about the journey of Naresh and his brother Rajesh, who shot wildlife from a hot-air balloon. “We have combined the art of ballooning with wildlife. This has been done for the first time in India. We flew over different national parks in the country. Basically, it was done to give different perspectives about natural animal habitats," says Naresh Bedi. Two of 13 episodes of this show, which were produced for Prasar Bharti in Hindi, have been selected for the festival. “The episodes were shot purposely in Hindi to capture more audiences, since most of the work done on big channels is in English," he explains. Bedi says the festival is about more than just films: “I think CMS is a good experiment, and the work they are doing is good to get environment enthusiasts involved. It’s no longer just a wildlife and film festival, like it used to be in the earlier years. They have diversified into many more avenues and overall, it’s a good attempt." In all, the event will showcase 106 films (73 Indian and 33 International) on 15 different themes of environment and wildlife—the 2007 festival attracted 275 entries from India and abroad. This time, there will also be two exhibitions, on Environment on Climate Change and Architecture for Humanity. The exhibition on architecture will deal with issues of tangible, humane and sustainable architecture possible today and will display projects from different corners of the world. 5th CMS Vatavaran: Environment and Wildlife Film Festival will be on from 27-31 October at the India Habitat Centre, New Delhi.